Happy Thursday! 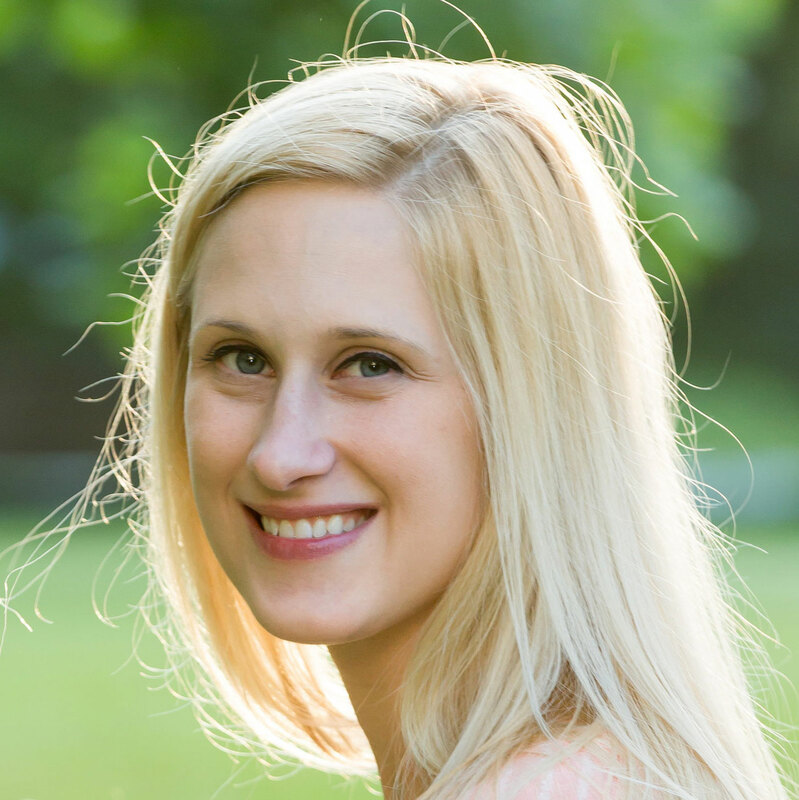 Today, I am sharing with you my first gardening-like post. 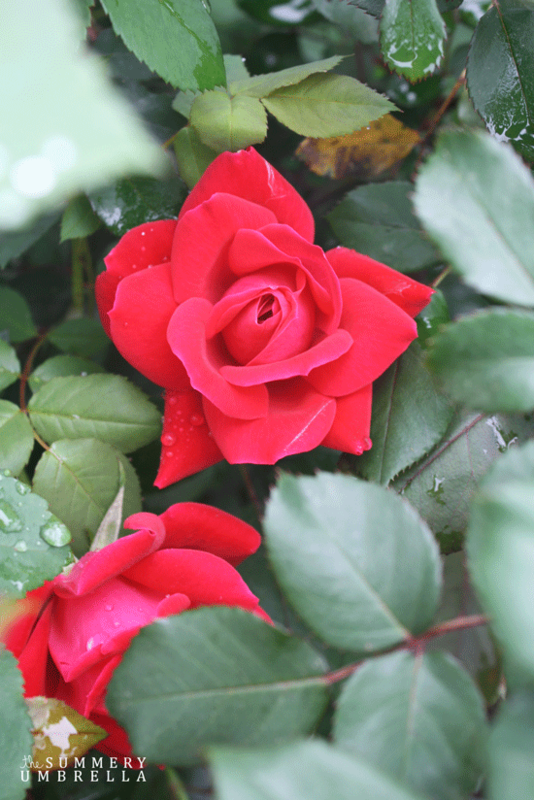 When we began renting this house, I was pleasantly surprised to acquire two rose beautiful rose bushes; one is light pink and one is hot pink, but looks red sometimes too. 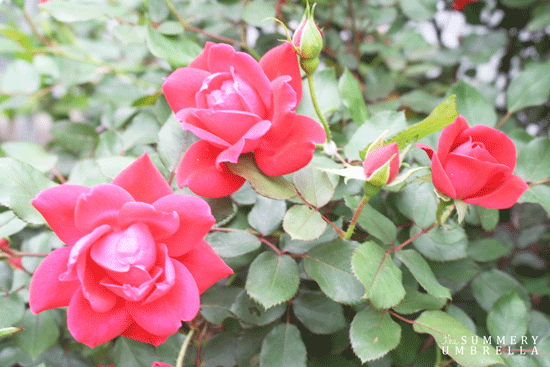 Do you have rose bushes? Would you like to have one? Apparently, you can’t kill a rose bush!! Unless you never ever prune it for a very long time. 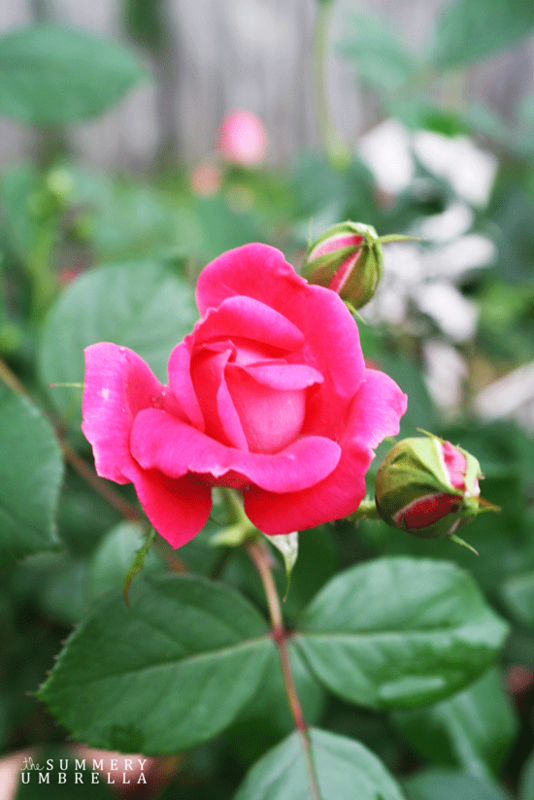 Why do I prune my rose bushes? Well, because of the hundreds of roses that come out because I prune the bush frequently. Just look at the picture below! This bush is the one in my back yard, it is getting a little unruly at this point; you can see how it has started to grow up really high and down towards the ground. But now that the roses are blooming, I can’t bring myself to do prune anything but the dead roses. Which parts should you prune and where? 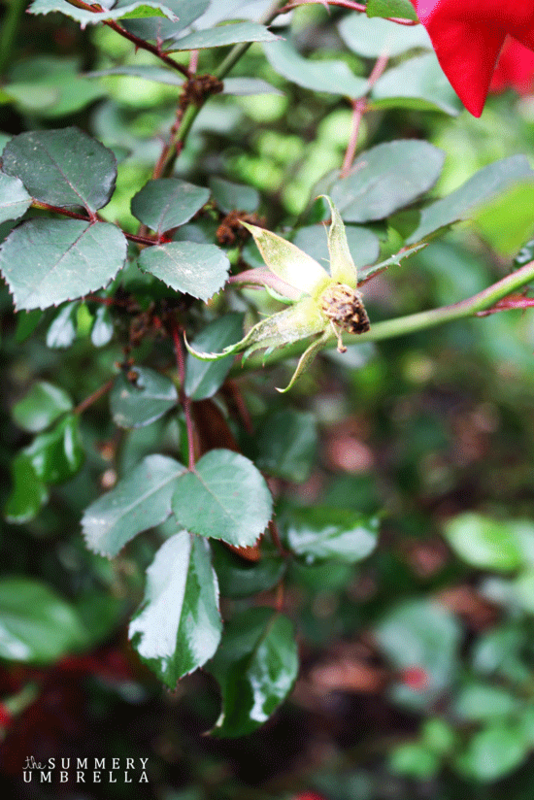 As you can see below, this is what a rose looks like after all of the petals have fallen to the ground. 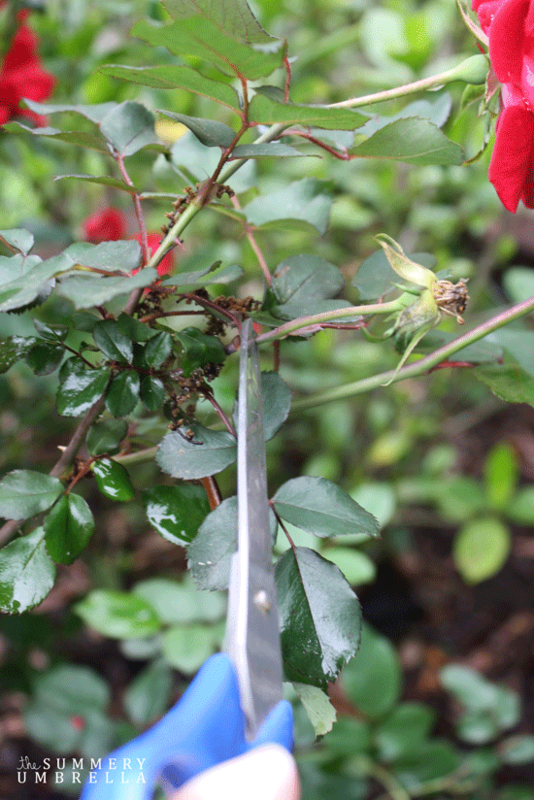 If you haven’t pruned the rose before this point, you definitely want to do it now! You need to cut the stem down at the next set of leaves. I use regular scissors to do this. When I prune the entire bush, I use large clippers. 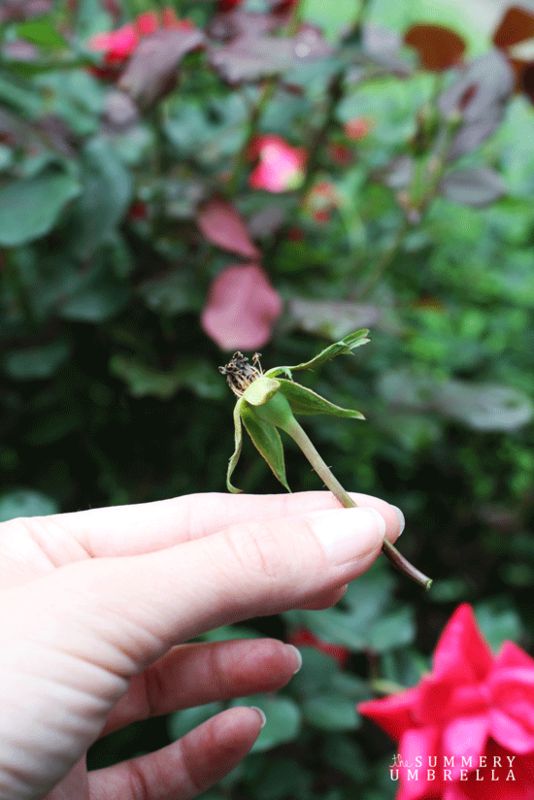 This is a close up of the dead part of the stem/rose that you want to cut off. 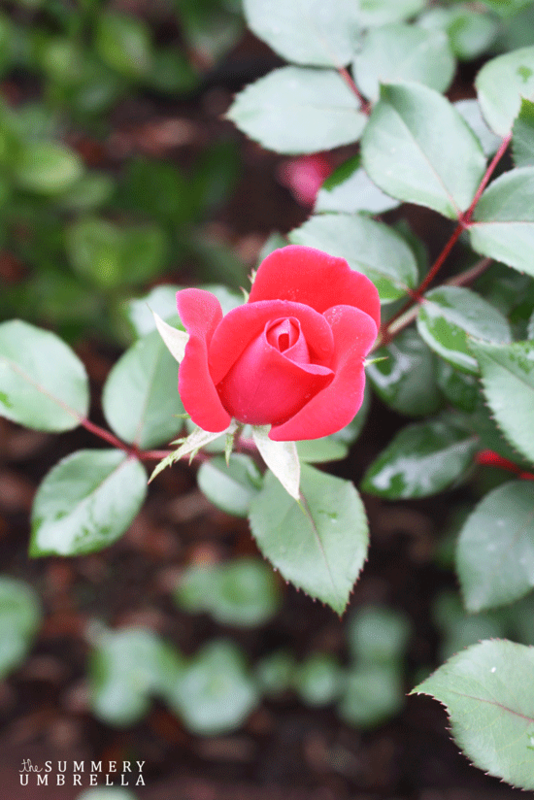 You will see a lot of these and need to cut them back as quickly as they come so that you can get more new roses! How often do I prune the bushes? I cut them back at the end of the Fall (when they are finished blooming) and the beginning of the Spring (before they begin blooming). This is when I prune the bush to the shape and size that I prefer. I cut the inside stems shorter than the outside stems because the middle always seems to grow taller. While the rose bush is blooming, I prune individual dead roses and stems. That’s it! It’s actually very simple. 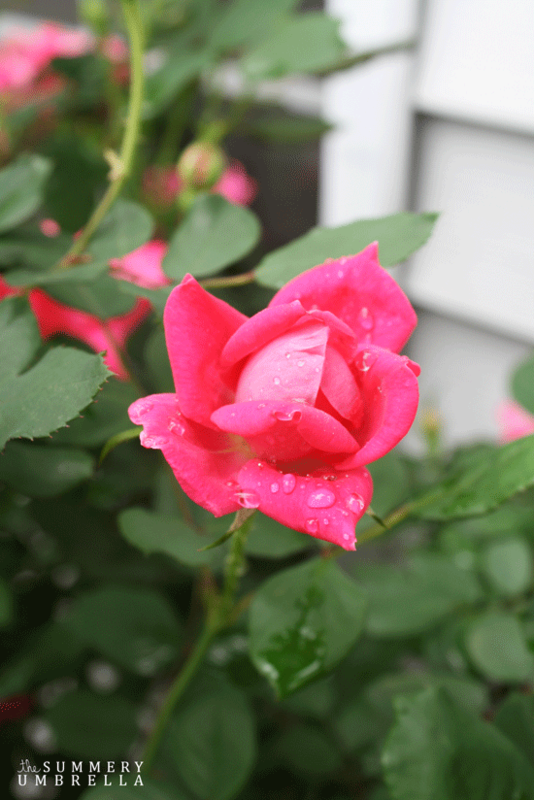 Rose bushes love full sunlight and there is no need to water; they thrive off of what they get from the rain. See how the buds are about to explode open??? 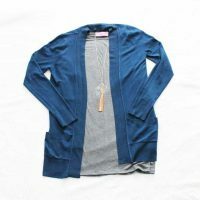 Ohhh I just LOVE it!!! When life hands you too many roses what do you do? You make rose water of course! 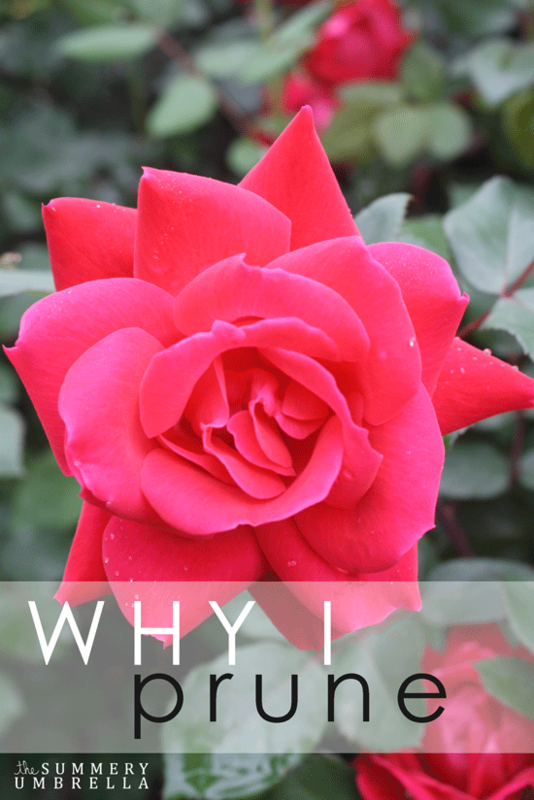 I love growing roses and blogging about them, too! I agree- you should prune and prune often, removing old blooms and any broken, damaged or diseased foliage, stems and canes. Here in Florida we have Black Spot like crazy! It just rained for 14 days straight, was hot humid and well, no doubt the Black Spot found my roses. Only one or two leaves on all but one bush… and that bush was eat up with it. So, time to break out the Dawn dish liquid and treat them. 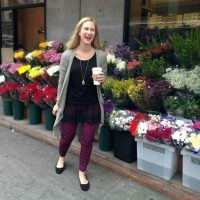 Great post and beautiful roses! omg! Your roses are freaking amazing! Obviously the explosion of color is worth a little work with pruning. My grandfather has a rose bush and never takes care of it and I can tell you I’ve never seen a (home) rose bush with quite so much color! Thank you so much! I do appreciate the beauty every day I see them; they make me very happy! :) Maybe you should “help” your grandfather prune his rose bush!! You might be surprised with the results and maybe he will like it too! Thank you for stopping by and stay tuned for my upcoming Rose Water post next week! I love roses, at one point we had 20+ rose bushes, I planted them 7 years ago and I love the old bourbon roses, or cabbage roses, the ones that look like peonies. But over the last two cold winters we have lost 4 or 5 of them. And I used to prune, I am kinda over it! I have a rugosa rose that you cannot prune, and right now it is my favorite! 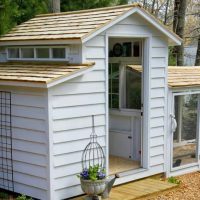 Before I started blogging I would spend 2 or 3 hours everyday in the summer between the garden and pruning, I just don’t have that kind of time anymore. I think I need to rethink the landscaping, but hate to kill living plants, so I will wait a year or so. They are gorgeous, but a lot of work!